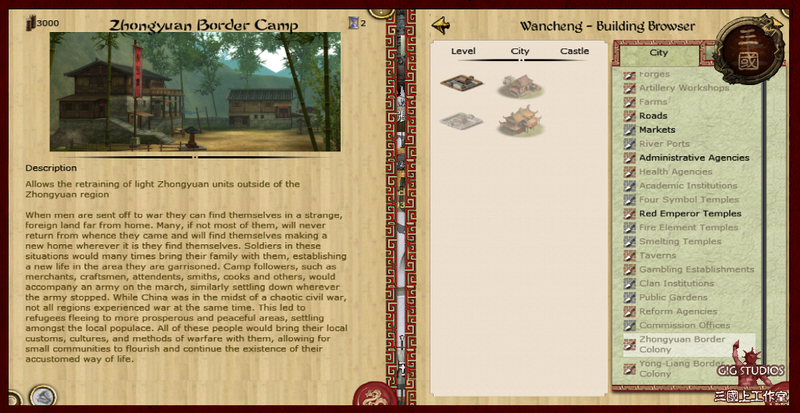 The previous and original version of this total conversion mod, "Three Kingdoms - The Fight for Supremacy," was a modification for Rome: Total War. However the developers modified the Rome.exe and included the complete game in their uploads. These made the modification illegal, thus TWC never allowed them to advertise the upload links or have an own forum. Later, Gigantus started a new project; he decided to port the old conversion to a better engine, namely the Medieval II: Total War: Kingdoms engine. Seether and others joined shortly after and released the first Beta in 2013 and, later, v1.4 in early 2014. After real life was sorted out, Gigantus and Seether joined forces once again in early 2018 to continue production of the mod. Version 3.0 was released on 20 December 2018 with the mod now currently standing at v3.2.028. Originally the v3.2.000 Patch was supposed to provide the ability to retrain regional troops anywhere in China-proper, regardless of the region. For example, Hebei troops could be retrained in Jiangdong, Zhongyuan troops retrained in Ba-Shu, etc. However, the EDB file could not handle the load (specifically the amount of units that could be recruited and retrained in the standard barracks, stables and ranges) and it caused severe stability issues. So much, in fact, that the plan for retraining regional troops anywhere had to be scrapped. However, thanks to an idea by Sir Matthias over at Total War Center, a different approach was taken. Essentially new buildings were created, which allow for the retraining of regional troops outside of their native region. These buildings can only be constructed in settlements that are on or near the border of another region and come in two tiers. In the screenshot below of Wancheng (which is located in the very northern reaches of Jingzhou region), you can see that it is able to build colonies for both Zhongyuan and Yong-Liang, which Wancheng directly borders. The first-tier building allows for the retraining of all light units (Sword, Halberd, Bow, Crossbow, and Cavalry - & Horse-archers where applicable), while the second-tier building allows for the retraining of all light and heavy units. Click here to download the v3.2.011 Hotfix. To install the Hotfix, first ensure you are Patched to v3.2.000 (Base v3.0, then v3.1.000 Patch, then v3.2.000 Patch). Then extract the RoTK v3.2.011 Hotfix.zip contents into your main Medieval II Total War directory and allow to overwrite. And don't forget to visit our official forum at Total War Center. Rise of Three Kingdoms Patch 3.2.000 has been released! The new 3.1 Patch adds new content to the Rise of Three Kingdoms mod. will u make mod when Total War Three Kingdoms comes out? Yes, I will, at least until I run out of content to add to this mod. I don't have much faith in Creative Assembly to create a good Three Kingdoms title and have't been impressed by what I've seen of Total War: Three Kingdoms thus far. why light harble skill is sheild wall but not spear wall? Because of animations. Spearwall (phalanx) and shield wall have different movement and formation animation sets; the former is suited for Pikemen, while the latter is for halberd troops. How did you do in the "Rise of Three Kingdoms" mod to have the banners (in custom battle) so low and smaller? I had tried to modify the "descr_banner_new.xml" file in another mod but it didn't give me the height of the banners like in "Rise of Three Kingdoms".